514 pages | 61 Color Illus. Event Studies is the only book devoted to developing knowledge and theory about planned events. It focuses on event planning and management, outcomes, the experience of events and the meanings attached to them, the dynamic processes shaping events and why people attend them. This title draws from a large number of foundation disciplines and closely related professional fields, to foster interdisciplinary theory focused on planned events. 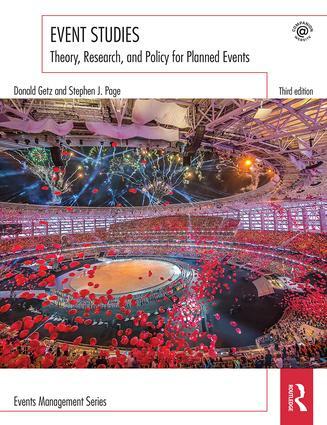 It brings together important discourses on events including event management, event tourism, and the study of events within various disciplines that are able to shed light on the roles, importance and impacts of events in society and culture. Companion website to include PowerPoint slides and updated Instructor’s Manual including suggested lecture outlines and sequence, quizzes per chapter and essay questions. Donald Getz is Professor Emeritus, the University of Calgary. He works as a management consultant and also holds guest positions at several universities. In addition to event studies, areas of expertise include wine and food tourism, evaluation and impact assessment, consumer research and special-interest travel. Professor Getz co-founded, and was Editor-in-Chief of Event Management an International Journal. Stephen J. Page is Associate Dean (Research) Hertfordshire Business School and Professor of Business and Management, University of Hertfordshire; author and editor of 41 books on tourism, leisure and events; and Editor of the journal Tourism Management. The events industry, including festivals, meetings, conferences, exhibitions, incentives, sports and a range of other events, is rapidly developing and makes a significant contribution to business and leisure related tourism. With increased regulation and the growth of government and corporate involvement in events, the environment has become much more complex. Event managers are now required to identify and service a wide range of stakeholders and to balance their needs and objectives. Though mainly operating at national levels, there has been significant growth of academic provision to meet the needs of events and related industries and the organisations that comprise them. The English speaking nations, together with key Northern European countries, have developed programmes of study leading to the award of diploma, undergraduate and post-graduate awards. These courses focus on providing education and training for future event professionals, and cover areas such as event planning and management, marketing, finance, human resource management and operations. Modules in events management are also included in many tourism, leisure, recreation and hospitality qualifications in universities and colleges.